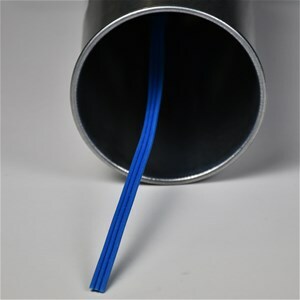 Cortec Cor-Pak Pipe Strip is designed for protection f tubes, pipes or conduits in storage or during shipping. Using VpCI technology, Cor-Pak Pipe Strip makes it possible to protect the interior of a tube or pipe against corrosion without expensive internal coatings. The flexible strip comes on a 500 foot roll and is 1/3" in diameter. It is extruded from low density polyethylene containing a proprietary VpCI compound designed for protection of ferrous and non-ferrous metals and alloys. It is especially effective on more expensive stainless steel and aluminum pipes. Cor-Pak Pipe Strip should be placed inside the tube or pipe, when is then capped or sealed. The length of Pipe Strip should equal the length of pipe. Within hours, the vapors from the Pipe Strip saturate the enclosed air space. Even in the presence of water vapor (high humidity conditions), the VpCI vapors passivate the metal surface and arrest the process of corrosion. The 500 foot 1/3" diameter Cor-pak Pipe Strip has a life span of 2 years in use and is recommended only for pipe diameters up to 6 inches.